Hey Everyone! This week we’re introducing our next morning barista, Lauren! 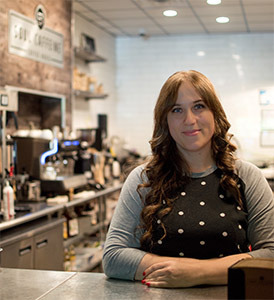 Lauren is kind, quite hilarious, and she’s a killer barista and baker! That’s right, Lauren is not only our barista, she is also our baker along with our head baker Mal. We just can’t get enough of her. While Lauren’s not baking or coffee making, she enjoys working out at Fit Body Boot Camp, reading, playing trivia, quoting movies and last but certainly not least she’s an amazing sunset photographer! Pop over to instagram, @laurenfurlong, and you won’t be disappointed! Lauren joined our team in August and we could not imagine it without her. If you’re looking for a cool concoction Lauren is your go to for new and fun flavors. Favorite Personal Creation: cinnamon bun and hazelnut. I like to make it when I’m missing fall. Thanks Lauren and thanks Soul Caffeine Community, we’re so lucky to have all of you! © Soul Caffeine 2016. All rights reserved.